After the Great Financial Crisis in 2008, the U.S. Federal Reserve took extreme action to support an ailing economy by taking interest rates to zero. After nearly nine years of unprecedented stimulus, policymakers decided to begin normalizing monetary policy. On March 15th, 2017, the Federal Reserve increased interest rates for the second time in three months – taking federal funds rate from 0.75% to 1.00%. Two to three additional rate hikes of 0.25% are expected this year. The rate hike decision was in-line with market expectations and supported by strong economic data. Investors expect the Federal Reserve to gradually withdraw liquidity from the system and anticipate normalization of policy to take years. Any unexpected, sharp tightening in rates could be a difficult environment for fixed income investors. Despite the increase in rates, U.S. fixed income was able to generated positive returns. The broad U.S. bond market returned 0.82%, global bonds ex U.S. returned -0.35%, and high quality short term bonds earned 0.44%. We have made small adjustments to our fixed income allocations to reflect the normalization of monetary policy by shortening duration and reducing our exposure to corporate debt and adding diversification to our fixed income holdings. 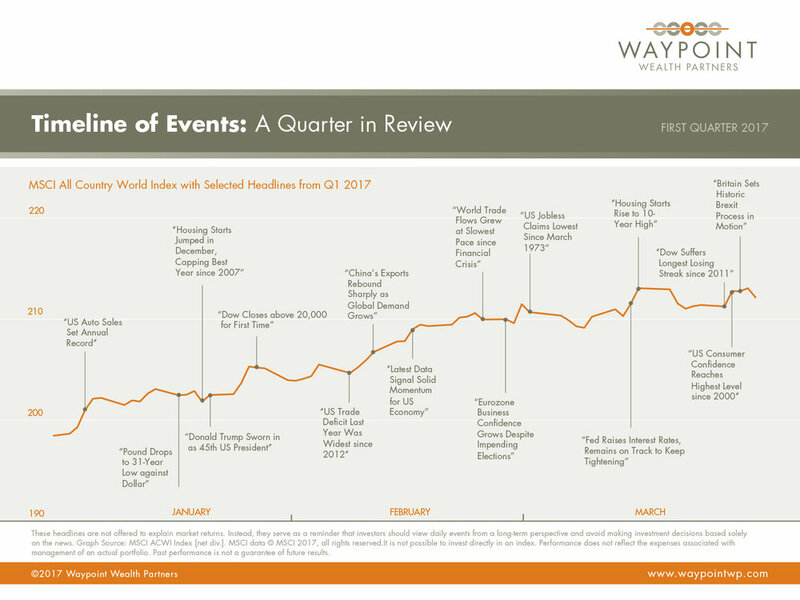 The first quarter was very positive for stocks across the globe and equity indexes ended the quarter with strong results. U.S. stocks continued its post-election momentum, reaching new highs in the S&P 500 and Dow Jones index during the quarter. The pro-business policies, encouraging economic data, and solid earnings caused a spike in optimism and buoyed the U.S. markets – S&P 500 finished the quarter up 6.07%. Markets outside of the U.S. performed even better. International developed markets returned 7.8%, while emerging markets continued its strong performance from last year and earned 11.49%. For now, investors are looking past the political risks in Europe and emerging markets and focusing on the improving fundamentals and positive economic momentum overseas. The U.S. is in the midst of the third longest economic expansion since 1900, approaching its ninth year. All indications and data suggest a healthy economy on firm footing. Labor markets are healthy with the unemployment rate under 5% and signs of higher wages. Inflation measures have improved – helped by a rebound in oil prices, and a strong labor market. More importantly, the personal consumption deflator, an inflation measure used by the Federal Reserve, is quickly approaching the 2% inflation target set by the Federal Reserve Bank. The U.S. economy appears to be on pace for another slow, but steady 2% growth and the global economy has real momentum behind it. It started to pick up steam at the end of 2016 and has not cooled down. The Eurozone is accelerating thanks to a weak currency and rising confidence. China has stabilized thanks to stimulus measures, and Latin America has benefited from a rebound in commodity demand. We are witnessing a rare, synchronized global economic expansion. Given this economic backdrop, the Federal Reserve is now more comfortable normalizing policy and raising interest rates. You can drive a car with a broken suspension system, but it will be an extremely uncomfortable ride and the vehicle will be much harder to control, particularly in difficult conditions. Throw in the risk of a breakdown or running off the road altogether and there’s a real chance you may not reach your destination. Of course, everyone feels in control when the surface is straight and smooth, but it’s harder to stay on the road during sudden turns and ups and downs in the market. And keep in mind the fix for your portfolio breaking down is unlikely to be as simple as calling a tow truck. For that reason, the smart thing to do is to diversify, spreading your portfolio across different securities, sectors, and countries. That also means identifying the right mix of investments (e.g., stocks, bonds, real estate) that aligns with your risk tolerance, which helps keep you on track toward your goals. Using this approach, your returns from year to year may not match the top performing portfolio, but neither are they likely to match the worst. More importantly, this is a ride you are likelier to stick with. Just as drivers of suspensionless cars change their route to avoid potholes, people with concentrated portfolios may resort to market timing and constant trading as they try to anticipate the top-performing countries, asset classes, and securities. Here’s an example to show how tough this is. Among developed markets, Denmark was number one in US dollar terms in 2015 with a return of more than 23%. But a big bet on that country the following year would have backfired, as Denmark slid to bottom of the table with a loss of nearly 16%. It’s true that the US stock market (by far the world’s biggest) has been a strong performer in recent years, holding the number three position among developed markets in 2011 and 2013, first in 2014, and sixth in 2016. But a decade before, in 2004 and 2006, it was the second worst-performing developed market in the world. Predicting which part of a market will do best over a given period is also tough. For example, while there is ample evidence to support why we should expect positive premiums from small cap, low relative price, and high profitability stocks, these premiums are not laid out evenly or predictably across the map. US small cap stocks were among the top performers in 2016 with a return of more than 21%. A year before, their results looked relatively disappointing with a loss of more than 4%. International small cap stocks had their turn in the sun in 2015, topping the performance tables with a return of just below 6%. But the year before that, they were the second worst with a loss of 5%. Adapted from “Investment Shock Absorbers” by Jim Parker, Outside the Flags column on Dimensional’s website, February, 2017. Dimensional Fund Advisors LP (“Dimensional”) is an investment advisor registered with the Securities and Exchange Commission. Diversification does not eliminate the risk of market loss. There is no guarantee investment strategies will be successful. Past performance is no guarantee of future results. All expressions of opinion are subject to change without notice in reaction to shifting market conditions. This content is provided for informational purposes, and it is not to be construed as an offer, solicitation, recommendation, or endorsement of any particular security, products, or services.